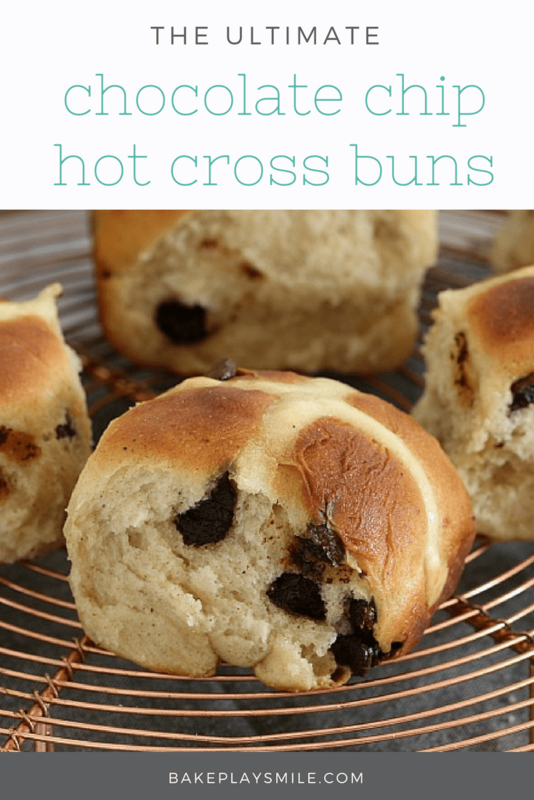 Satisfy your inner chocoholic with a batch of these delicious Chocolate Chip Hot Cross Buns! Simple, homemade and totally delicious! 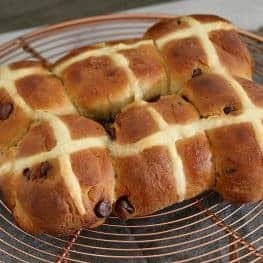 I love a good old Hot Cross Bun and I’m not even too fussy when it comes to the different varieties either. I’m just as happy to nibble away on a traditional one with sultanas, as I am to go a bit fancy with some of the new variations (I really want to try making a Mocha Caramel version that I saw in a bakery the other day – how brilliant!). 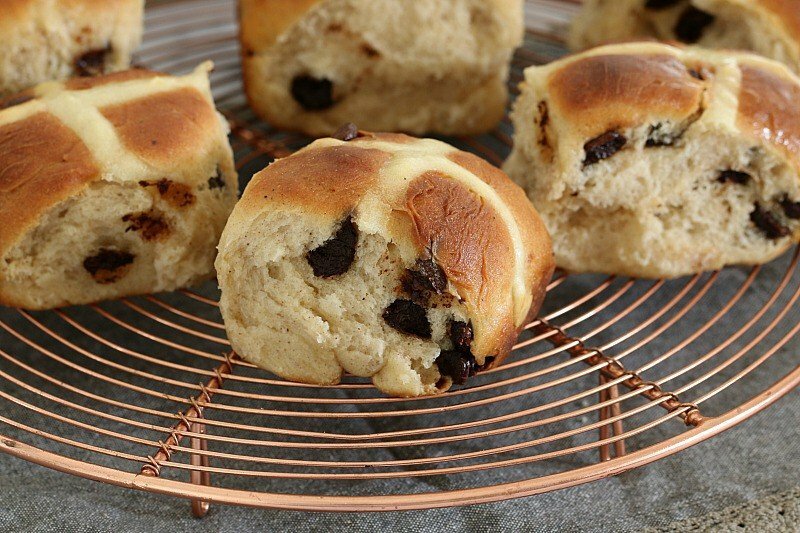 Anyway, as you know, I am a girl who adores my chocolate – so it makes sense that these Chocolate Chip Hot Cross Buns are very high up on my ‘OMG I love you’ list (yes, there is such a list). And so, as I do every year, I made a batch of chocolate chip hot cross buns. 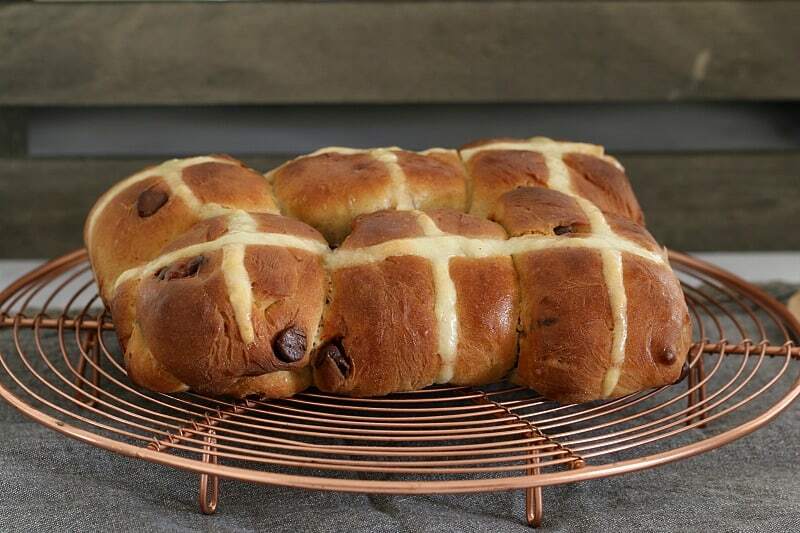 Have you ever tried a chocolate chip hot cross bun straight out of the oven? Errrmeeegod!! The chocolate is all soft and melty-like and is just amazing. Like a little bite of heaven really. I like to toast my hot cross buns under the grill and then add a bit of butter. However! I saw on Pinterest the other day (yes, the place where I spend far too much time), that someone had smothered their chocolate chip hot cross buns in Nutella. I nearly died. Why have I never thought to do that!? Perhaps I’m losing my chocolatey touch!? Eeeek! Let’s hope not!! 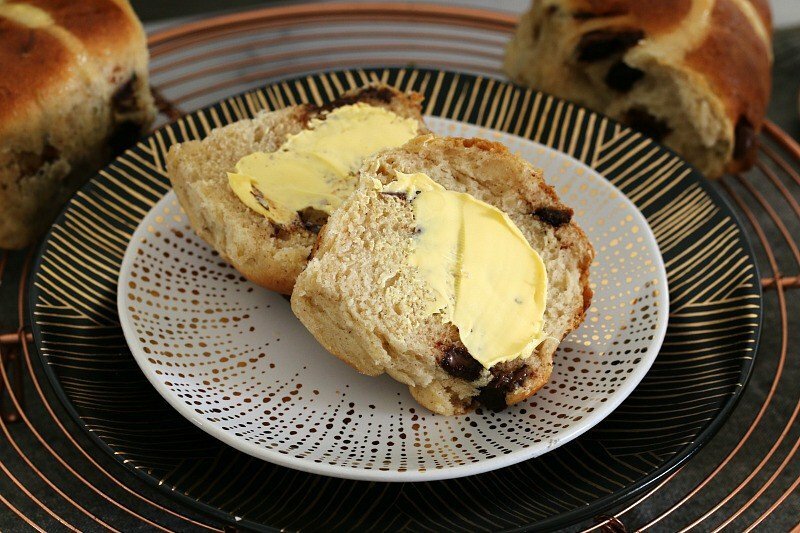 Are you a classic hot cross bun fan, or do you like a bit of variety too? 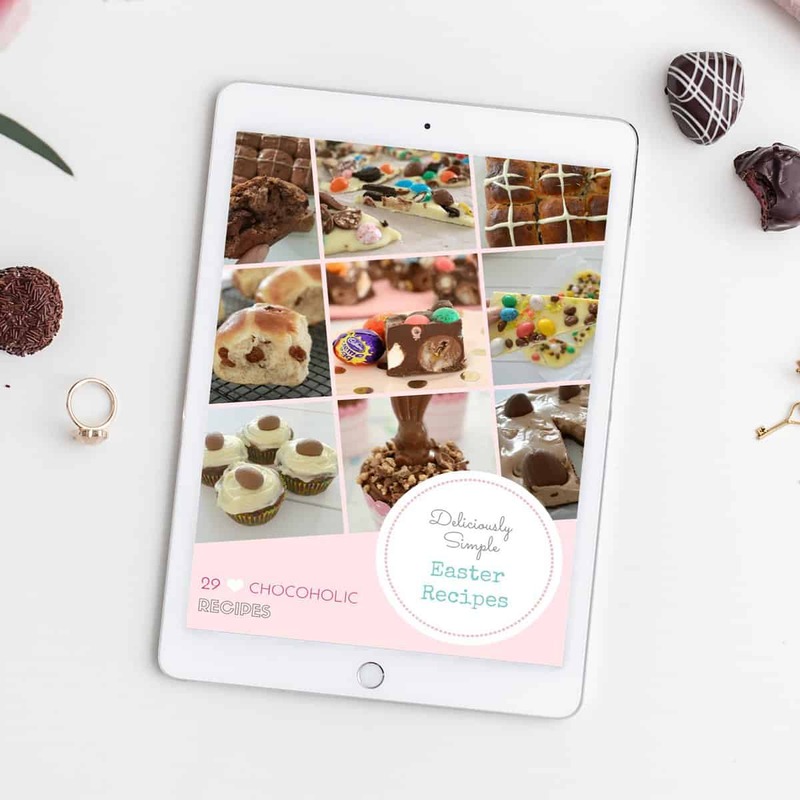 For more yummy Easter recipes, check out our EASTER RECIPES EBOOK packed with 28 of our most popular recipes (available in both conventional and Thermomix versions) for just $10.00. Get the eBook via instant download and then save to your computer, tablet, phone or iBooks. If you’d prefer a hard copy, all of our eBooks print to an easy-to-read A4 size. 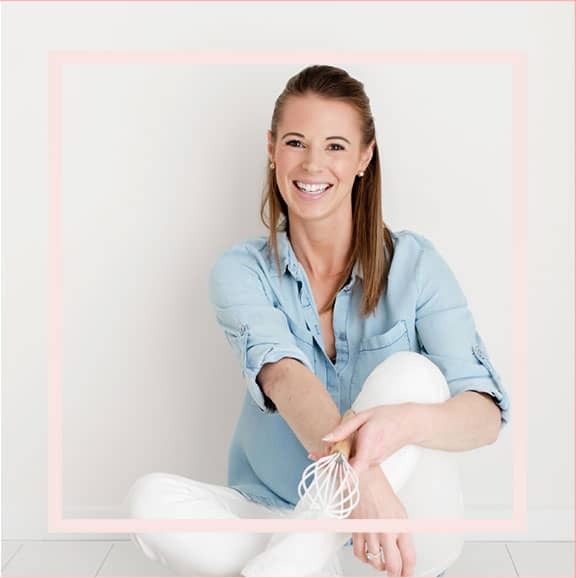 Shop the conventional version here or the Thermomix version here. Combine the room temperature milk and yeast in a small bowl. Set aside in a warm place for 10 minutes or until frothy. Combine the milk mixture, butter and egg in a jug and whisk to combine. Combine the plain flour, salt, cinnamon, nutmeg and sugar in a bowl. Pour in the milk mixture and use a wooden spoon to stir until just combined, then use your hands to bring the dough together. Turn onto a lightly floured surface and knead for 10-15 minutes or until smooth and elastic. Place the dough in a bowl and cover with a damp tea towel and place in a warm spot for 30 minutes or until dough has doubled in size. Divide the dough into 12 portions and knead the chocolate chips through with your hands. Grease and line a baking tray (I find it easiest to use 2 X 20cm square baking tins) and place 6 dough balls 1cm apart in each tray. Leave to prove for a further 20 minutes. Meanwhile, mix the flour and enough water to make a smooth paste together in a small bowl. Place the piping mixture into a piping bag (or a sealable ziplock bag with the edge corner snipped off). Pipe crosses onto the buns. Place the tray into the oven and bake for 15 minutes or until golden. Leave to cool for 5 minutes then transfer to a wire rack. While the buns are still warm, heat the sugar and water in the microwave on medium heat for 1 minute or until the sugar has completely dissolved. Brush the syrup over the top of the warm buns. 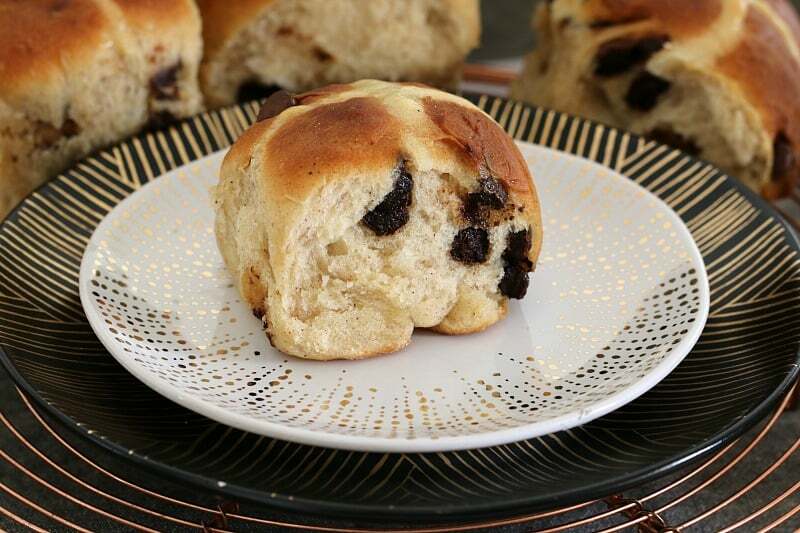 Satisfy your inner chocoholic with a batch of these delicious Thermomix Chocolate Chip Hot Cross Buns! Simple, homemade and totally delicious! Place milk and yeast into the TM bowl and heat for 1 minute, Speed 1, 37 degrees. Add flour, salt, softened butter, sugar, egg, cinnamon and nutmeg and mix for 6 seconds, Speed 6. Knead for 2-3 minutes on Interval speed. Work the dough into a ball on a lightly floured board. Place in a bowl and cover with a tea towel. Keep in a warm place for 30 minutes to allow the dough to prove (it should double in size). Knead the chocolate chips into the dough portions and roll into balls. To make the piping, mix the flour and enough water to make a paste in the TM bowl for 20 seconds, Speed 4. Scrape down the sides and repeat for a further 20 seconds. Place the mixture into a piping bag (or a sealable ziplock bag with the edge corner snipped off). Meanwhile, heat the sugar and water in the TM bowl for 2 minutes, Speed 4, 100 degrees. Brush the syrup over top of the warm buns. Leave to cool slightly before transferring to a wire rack to cool completely. These would be perfect for the sultana hater/chocolate lover in my life and I love the chocolate cross, that just tops it off! WOW! I’m so impressed, these beauties look even better than the real thing!!! I have to try. I just loving eating anything bread-related straight out of the oven! Oh thank you! 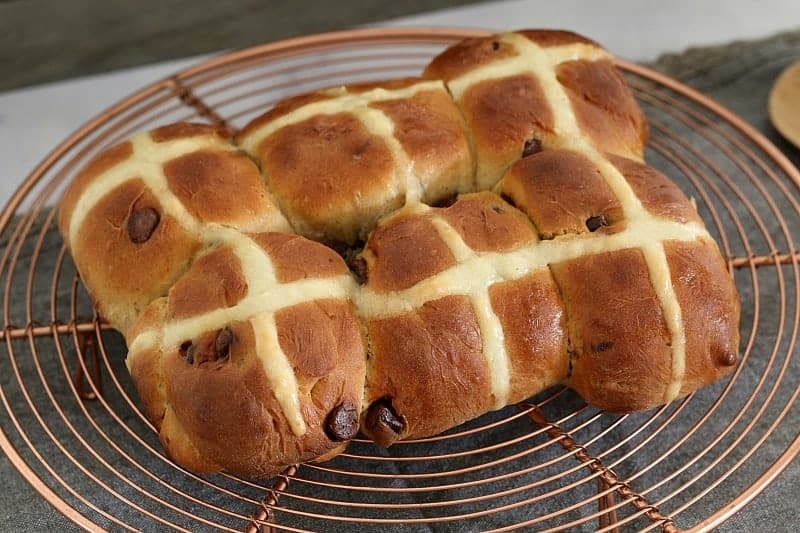 Yes… theres nothing better than fresh hot cross buns. 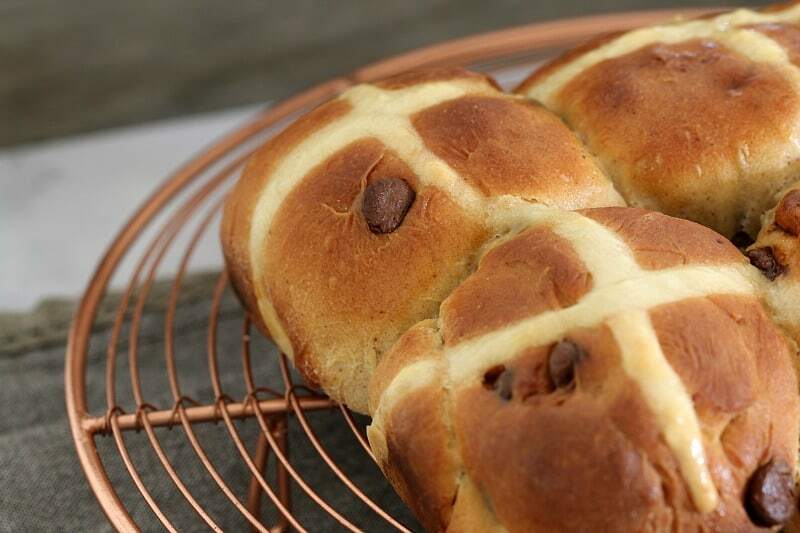 I’m more a traditional hot cross bun-er but hubster will go anything that involves chocolate – the more the better. In fact I’m pretty confident he would prefer your blog to mine haha!!! Hahaha oh I don’t think so – but he’s soooo on the right track when it comes to chocolate!